But I need to step out of this. How can I move HEAD back to the previous location? I have the SHA1 frag (23b6772) of the commit that I need to move it to. How can I get back to this commit? Before answering let's add some background, explaining what is this HEAD. At this point, you can create a branch and start to work from this point on. "Undo" the given commit or commit range. The reset command will "undo" any changes made in the given commit. A new commit with the undo patch will be committed while the original commit will remain in the history as well. Here's an approach that may be very simple and easy to remember. Check 2 conditions and finish with 1 command. Then you're back on track. simply check out that branch (i.e. 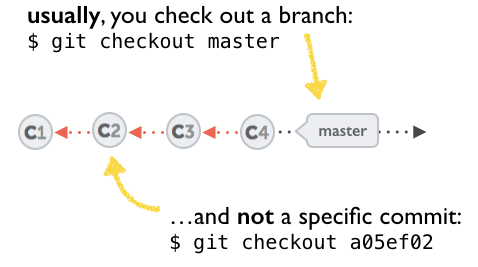 type git checkout <branch_name>; you see Switched to branch <branch_name>). You can now continue adding and committing your work as before; changes will be tracked on <branch_name>. Note that if you had saved work while HEAD was detached, in most cases that work will be merged automatically in the above process. If you see a message about a merge conflict, don't panic. There are several great tutorials with simple steps for fixing the conflict and completing the merge. 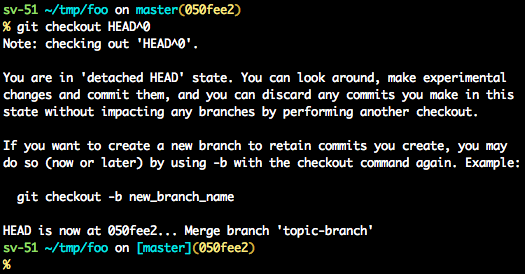 On branch master Your branch is behind 'origin/master' by 17 commits, and can be fast-forwarded. 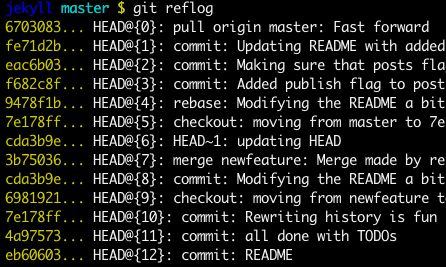 I was in detached-state with HEAD at 23b6772 and typed git reset origin/master (because I wanted to squash). Now I've changed my mind, how do I go back to HEAD being at 23b6772? But I hit this question because I got sick of typing (copy & pasting) commit hashes or its abbreviation each time I wanted to reference the previous HEAD and was Googling to see if there were any kind of shorthand. It turns out there is! Which incidentally was the same as cd - to return to the previous current directory in *nix! So hurrah, learned two things with one stone. When you run the command git checkout commit_id then HEAD detached from 13ca5593d(say commit-id) and branch will be on longer available. You will be back to previous location with updated commit from remote repository. Not the answer you're looking for? Browse other questions tagged git git-checkout git-reset git-revert git-reflog or ask your own question. Mistakenly gave 'git reset --hard origin/master'. How to undo this? How to undo several Git commands? How do I revert Git changes that I haven't committed? 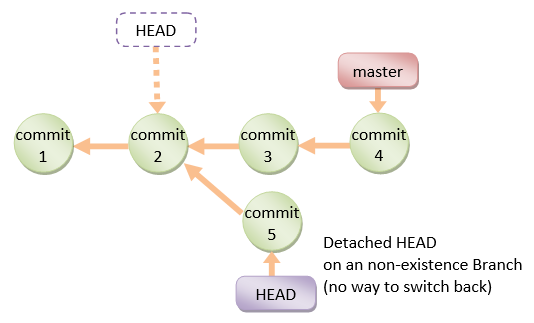 Git: how to “undo” or fix a commit? How to cancel Git Commit after pulled?